We all know someone that seems to continually stand out from everyone else. They make it look completely effortless, and they always seem to be happy. How do they possibly keep up this façade? 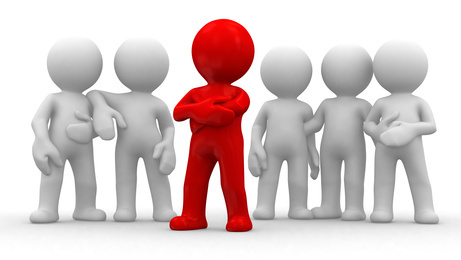 People that naturally have a personality that stands out in a crowd have honed skills that many of us have not. Here is a list of seven tools that you can use to be on your way to standing out in the crowd, too! Being able to walk up to anyone and start a conversation is a great test of confidence. Challenge yourself to talk with others about subjects that you know well. You will want to practice many times with friends that you trust. Get feedback on how you did and what you can improve. Pay attention to your gestures, speaking voice, and intonation. Each of these secondary personality traits speaks to your level of confidence. When we’re in a room of people that we do not know, we tend to feel awkward, shy, and a multitude of other uneasy feelings. A simple way to overcome this feeling is to learn to do things alone and to trust that everything will be ok. Try going to the movies or dinner alone. Being around others that you do not know will help you become comfortable in your own skin. When observing people that stand out, you will notice that they perceive and record in their minds many personality traits. They gauge conversation direction, tone, and level of formality and respond to the personalities around them accordingly. Listen closely to what people are saying and how they are saying it. Try to use what is being said to your advantage, and try to fit your perceptions of others into your knowledge and experience. People tend to judge one another within the first few moments of meeting. Trust is a key element in this judgment process, therefore, be sure that your appearance is appropriate to the situation. Dress in a non-threatening manner, and ensure that you speak in a way that fits those around you. Regional accents and dialects can affect perception and affect how much someone trusts you. Everyone loves someone who is knowledgeable, but no one likes a know-it-all. Therefore, even if you do know it all, don’t present yourself in this fashion. Speak and present in a way that you are making others feel like they are your intellectual equal. Stay informed, stay educated, and stay connected. Always knowing what is happening around you, remaining current on your knowledge, and creating a network not only makes you authoritative but also is a great strategy to successfully standing out. Last but not least, always exhibit a happy personality. People are naturally attracted to happy, upbeat, and positive people. While we’re not happy all of the time, it pays off in many ways to always show others a genuine smile. Practice these skills whenever you are in public, at work, at school, wherever. Remember that practicing something for 10,000 hours will make you an expert! They take a lot of hard work, but you, too, can stand out in the crowd! I was thinking about the truly great people that I know or have known in my lifetime. What makes them stand out in my mind? What makes them special? What makes them interesting? Why do I wish to emulate them? There is one common thread that each possesses — it is the unique ability to merge creativity with an analytical mind. Let’s take a quick look at technical thinking. In most cases, technical thinking involves some sort of predictable outcome. When there are many possible answers, we draw on past experiences to structure how we think. We create a logical flow in our minds, focus on the answers or what outcome we want to achieve, then seek the safest route to achieve our objective. Looking at creative thinking, we see that there is a less ordered or focused approach. Typically we think with our emotions, daydream, and even brainstorm ideas. We are inspired by our creative thinking to do things that are unexpected and unpredictable. It is very important to realize that we also demonstrate an attitude through our creative thinking, therefore, we need to focus on portraying a positive attitude. People that can truly connect with both ways of thinking will typically find that they have richer lives. They often employ the ideas featured in my post on “The Right-Brained Revolution” to solve everyday questions. I find these individuals fascinating and quite wise, thus why I wish to emulate them. Each of us has the ability to be both creative and analytical. It depends on what we choose to exercise most. I would love to challenge everyone to do both. You just may be surprised by the results!